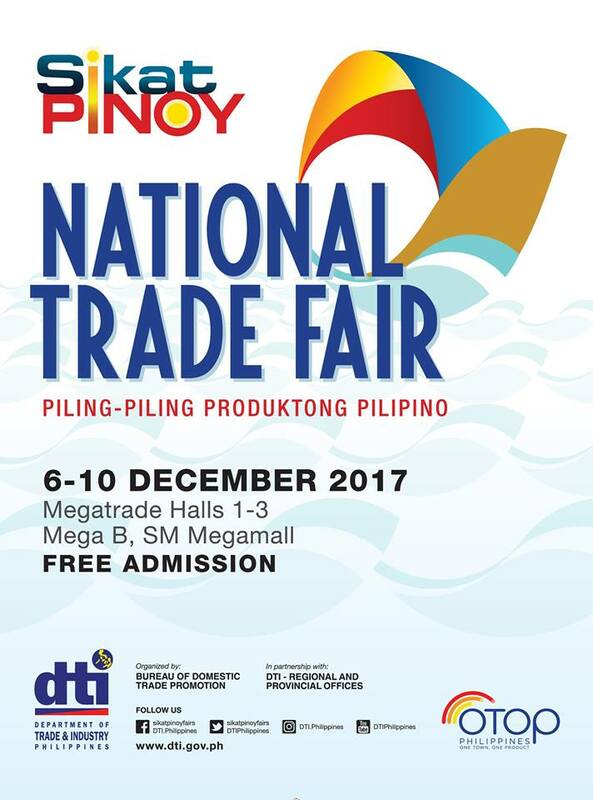 Sikat Pinoy's National Trade Fair happens on December 6-10, 2017 at the Megatrade Hall, SM Megamall. This year’s edition of the Sikat Pinoy National Trade Fair will have the “balanghai” as its centerpiece. Beyond its function as a watercraft used for inter-island travel and trade by our ancestors, the balanghai also represented the early Filipino society’s most basic socio-political unit, which has now evolved into our present-day barangays. With the renewed focus on the One Town One Product (OTOP) concept, the balanghai is definitely the fitting symbol to draw in the unique contributions across regions while linking the Filipino traditional values of community, creativity, and commerce. The Sikat Pinoy National Trade Fair will be first and foremost a showcase of the products of 240 One Town One Product (OTOP) micro, small, and medium enterprises (MSMEs) engaged in the manufacture of gifts, houseware and decor, wearables, fashion accessories, furniture and furnishings, household linen, corporate give-aways, processed food, and health and wellness products. Representing all regions of the country, the MSMEs will be offering their products for retail sales to consumers, as well as for order-taking from institutional buyers. Aside from OTOP products, the fair will also display the products of beneficiaries of the DTI’s Shared Services Facilities (SSF) Project as well as selected machineries and equipment. The SSF is one of the strategies of DTI which is aimed at increasing the productivity and improving the competitiveness of MSMEs by providing them with machinery, equipment, and tools under a shared system. Other highlights include an area specially allocated for the Bangon Marawi Program where affected MSMEs will exhibit their products to give them the opportunity to rebuild their businesses which were affected by the recent crisis. As in all other Sikat Pinoy fairs, a Coffee Pavilion will offer choice coffee and local blends from all over the country. The Sikat Pinoy National Trade Fair is organized by the Department of Trade and Industry through the Bureau of Domestic Trade Promotion (BDTP) in cooperation with the DTI’s Regional and Provincial Offices. Open during mall hours from December 6 to 10, 2017, the fair is open to the public. Admission is FREE. For more information, please call DTI-BDTP at 751-3223, or email bdtp@dti.gov.ph.